PRICEY PROM: Seniors Emma Barnett and Grace Silver posed at the prom last year, which was hosted at the Children’s Museum. This year’s prom will be held at Crane Bay, and the theme is masquerade. Prom takes place the weekend after spring break, which means that the rush to buy a dress or tuxedo, find a date or group to go with, decide whether to go to a restaurant or eat at prom, and order a corsage and boutonniere is closely approaching. Out of all these factors that go into prom, the biggest struggle for girls is finding the right dress. There are many different options when it comes to finding a dress that include going to stores and trying them on, renting a dress, buying online and the newest trend: buying a used dress off social media. Many people see an immense amount of Instagram or Snapchat “stories” that show dresses from previous years being sold by high-schoolers. Some people may click through the stories and not give them a second glance, but other people may click on the story and give the girl who is trying to sell her dress an offer. 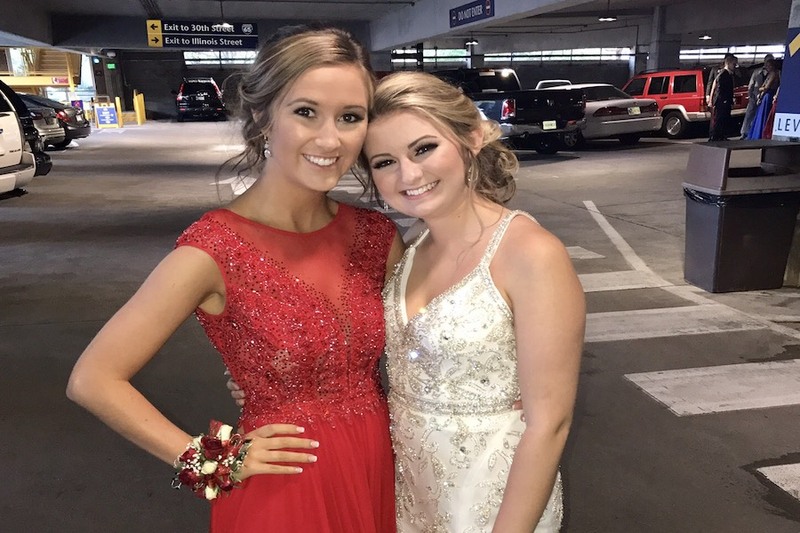 Senior Hannah Rollins posted a picture of her dress on social media and senior Emma Barnett took to word of mouth and had people come up to her asking to buy her dress. Both ended up having someone who was willing to buy them. “I posted my dress on my Instagram story, and once [junior] Ellen [Schrader] told me she wanted it, I told her she did not need to pay me, but she gave me $40,” Rollins said. Many girls will buy their dress for a certain amount of money, but then sell their dress for less than what they originally bought them for. This is a good opportunity for someone to get a good price on a dress that was once really expensive. Selling a dress is good way for a girl to make some money off a dress they are never going to wear again and maybe put that money toward a dress for this year. “I used the money from my dresses to purchase concert tickets for the summer,” Barnett said. Another stressful aspect of buying a prom dress is being able to meet the school requirements. As many girls have been informed each year, there are clear statements in the school handbook that say exactly what boys and girls are allowed to wear to prom. In the handbook, the guidelines state that bare midriff and bare back are not allowed. The question of the matter, however, is what qualifies as bare midriff and bare back. If someone is concerned with their dress and they are not sure if the dress is appropriate or not, they can always email Hartford a picture of their dress. Girls can also wear a jacket or wrap to prom if they are still concerned. Once the day of prom actually approaches, the worries will likely fade, and the fun will begin.